Youth Radio Vermont (http://youthradiovermont.org) is a program of the Vermont Folklife Center in Middlebury, VT (http://www.vermontfolklifecenter.org) that trains kids in the art of radio documentary production. The program gives kids the skills to develop, produce, and edit stories about themselves and the communities where they live. 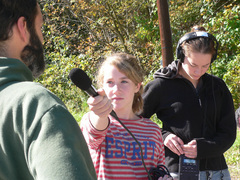 Youth Radio Vermont got its start in 2006. In its first year, the program touched down in Middlebury, Rutland, Tinmouth, and Montpelier, Vermont. Youth Radio Vermont is just getting underway with a new class of kids at Winooski High School. What is the one thing you would change about your life?